This is Midget block #110 and it is called Arrowhead. It is simple applique in 9 pieces. The brown fabric was leftover from the backing for Roll Roll Cotton Boll and the pink was leftover from Double Delight. I'm still working my way slowly through the blocks I prepped for our Christmas cruise. I'll have to get another batch ready soon, it has been so nice to be able to just pull out a page protector and stitch up a block while watching TV in the evenings. It makes me feel like I'm being productive even when I'm just relaxing. 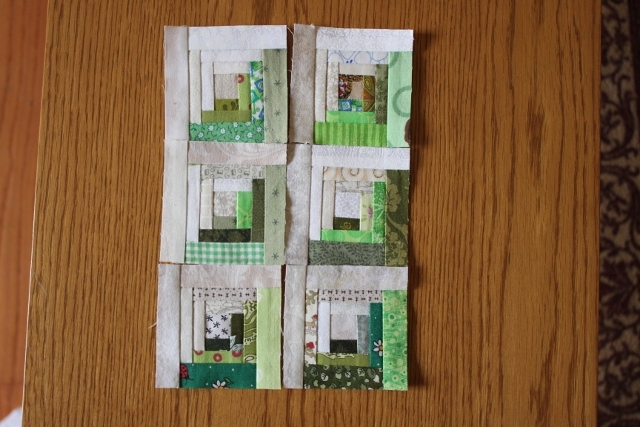 I made just a few more green blocks this afternoon. 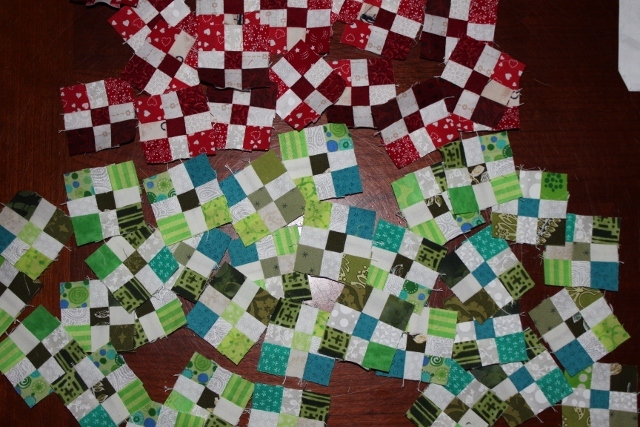 Little nine patches from one inch strips. They will finish at 2.5 inches when they all come together. 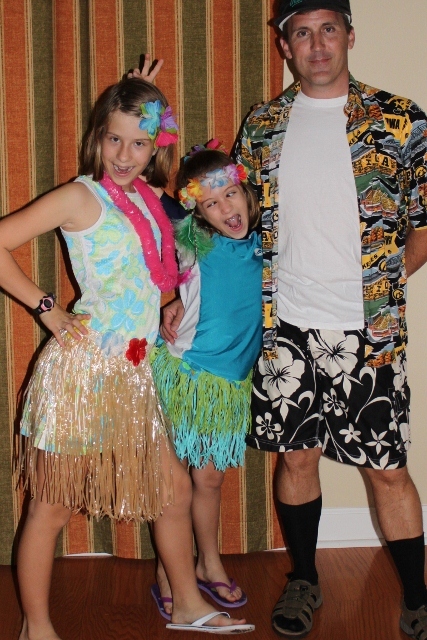 Also, a quick picture from the father daughter dance on Friday. It was a Hawaiian Luau. Kurt took the girls while Ryan and I hung out at home eating pizza on the couch. Now I'd better get to work on grading some essays. I promised my AP students I would have the free response questions from their last test ready by Monday. Maybe I can add them all up while I watch the Oscars. I finally found some time to sew today. 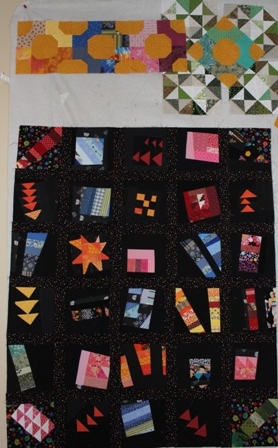 The weekend was zooming by and I thought it might slip away without anything accomplished on the Rainbow Scrap Challenge. Instead I stole away some time and put together these green log cabin blocks to go with the red from last month. I wanted to print out some more templates for a few green houses, but my computer is on the brink of death. I've got a new one, but Kurt is still working on getting all the old files off for me. I'm still getting used to a new machine and trying to get all of my favorite programs up and working. Last night we all went to a performance for Anna. 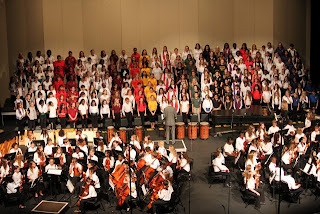 She was invited to be part of an all county honor chorus with 6th graders from each elementary school. They chose 8 singers and 4 strings members from each school. 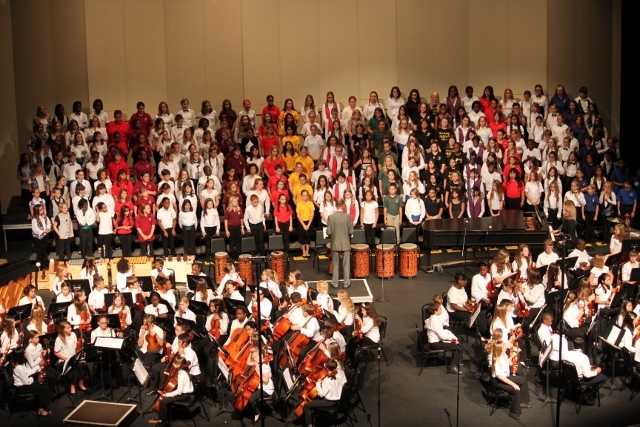 With about 30 schools represented, it was quite an ensemble. Anna is in the second row from the top, four in from the right side. See her? It was a little like "Where's Waldo" when the kids all came at the beginning of the show. The green month has zoomed by leaving just 5 more days to use up your green scraps. Hope you are all finding lots of fun projects to keep you busy. 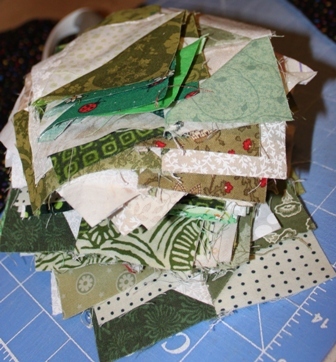 I know I don't have nearly as much green in my finished pile as red from last month, so I hope to change that today. Use the linky below to share your own scraphappiness. Midget Block number 86 is called Grandmother's Brooch. It is (gasp) hand pieced with 28 pieces. There are templates (shocking) supplied with the pattern as well as rotary cutting instructions. I was a bit confused by the directions for the red squares. Four were supposed to be cut at 1 3/8 inches while the other four were 1 3/8 by 1 5/8. 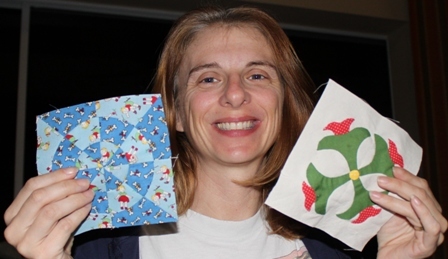 I tried the smaller size, but could not make that work so ended up cutting new squares at the larger size, but made them square, because that is the way I think squares should be. 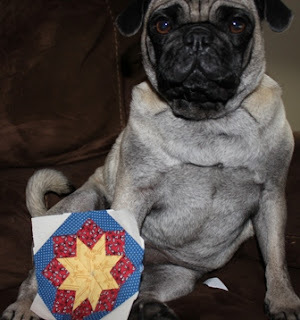 Lizzie was kind enough to pose with the finished block for me, she is fast asleep again now and snoring up a storm. Too much excitement I guess, seeing such a remarkable hand sewn block in person. Today was a day off school for the kids but not for the teachers. Kurt took the day off and went with the kids to Legoland. It is new and we hadn't been yet. It was a big hit. So much so that they had record crowds and ended up staying open late to accommodate everyone. That left with me with some quiet time at home after my training. Allergies have gotten the best of me, and I didn't feel much like sewing. I did spend some time ironing and folding though. 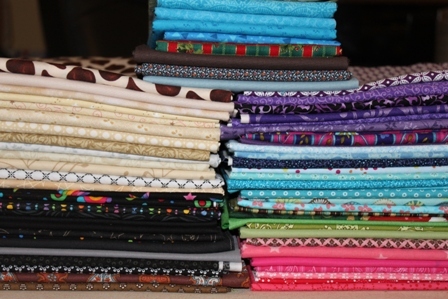 Not all of this fabric is new, some just got pulled and auditioned or had some cut off to be used. It does seem like a lot of fabric though, doesn't it? I'd better get it put away before people start asking what it is all for. It has been a sleepy day all day today. The kids are off school tomorrow, so they are still in weekend mode. I've got training all day and the rest of the family is going to Legoland. 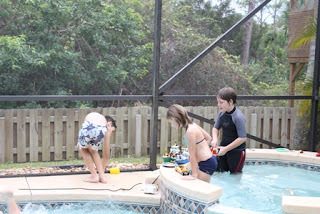 They had fun at the Lego Team end of the year party yesterday. The big event was seeing which lego boat could hold the largest number of coins. I think we'll be pulling money and legos out of the filter for a few days. It was a good excuse to start getting the pool in shape for summer though. Sydney helped with pressure washing while I swept away spider webs. It looks so much better now, though I think repainting the deck is still on the list of upcoming projects. I got lots of sewing done today, though I can't show any of it yet. I am all set for a month's worth of Tiny Tuesdays though, which makes me very happy. 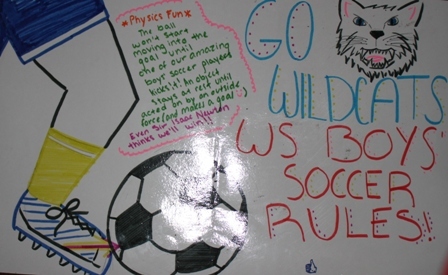 After an exciting volley of back and forth goals last night, West Shore won its first EVER state championship soccer game in a second sudden death overtime. Wow! The moment the last goal went in the other team sunk to the ground in abject horror. Their fans fought off tears while ours jumped up and shouted in shocked surprise. We don't have a football or baseball team, kids don't apply to our admission lottery to play sports, they come for the academics. So to compete for our first ever state championship game in any sport was SO exciting. Most of us were thrilled to just make it to the final game, to actually win was amazing. It is a busy day today. I should really make a trip up north to support our science fair kids, but I'm also supposed to run a girl scout cookie booth, host a lego end of the year party and get Anna all set for a slumber party. 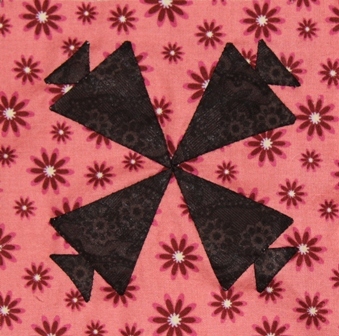 I will make some effort to sew a bit, but tomorrow is looking a bit more promising for ScrapHappiness. How about you? Any green goodness to share? MY school, the one best known for our outstanding academic programs, is competing for the state championship in soccer tomorrow night. Amazing! The local paper had an excellent article on it this morning. This is Midget Block 84. 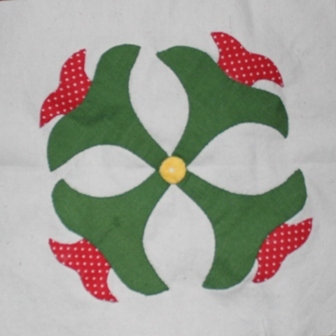 It is called Mill Wheel and is appliqued. It is another one of the really cool blocks that uses two blocks that are pieced and then rotated before one is trimmed down and sewn on top of the other. 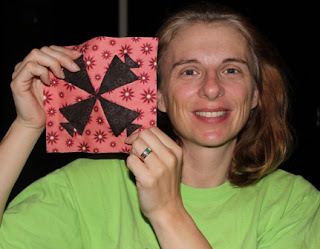 I did one with four patches earlier and a flower shape. 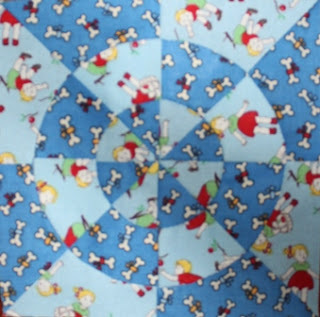 This one is pinwheels and a doughnut shape. It has 24 pieces, though it started as only 16 before the layering. The next block was started several weeks ago but languished. 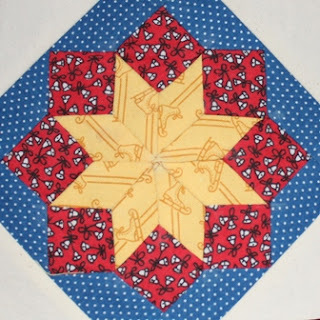 It is number nine from the extra Midget Applique series. It is called Flower #6, which is a distressing unoriginal name. I think it should be called Honeysuckle. It has 10 pieces. I'm not sure why I woke up so early this morning. Eventually I decided to do something useful with the time. 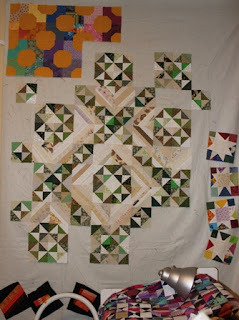 I got borders on the crumb-along blocks as well as a few Jamestown Landing blocks put together. The cheddar bow-ties have overfilled the wall they are on. I think I need one more row in either direction to get it to be the size I'd like. I still have an hour before I need to be awake, I think I'll go give sleep a try. Today I finally got into the sewing room again. I would have worked on the borders for Orca/Flamingo, but honestly, I'm not sure where they are. 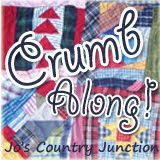 I started shuffling things around a bit and tidying odds and ends until I stumbled across the crumb blocks still left from the crumb-along at Jos Country Junction. 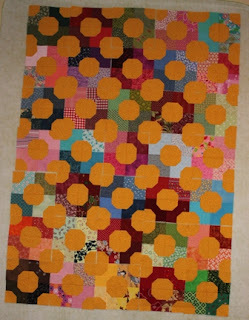 I had about half the finished blocks I needed but lots of orphan crumb bits in my happy scrappy jars. So I dug and sewed and ironed and trimmed, making a huge mess along the way. All I need are some borders and my crumb quilt will be ready for quilting. While that was going on I worked a bit more on Jamestown landing. I'm not quite sure how many broken dishes blocks I have, or how many I need, but there are some more ready to work through the system. Orca (Flamingo) Bay has been sitting in pinned rows by the machine for several weeks. I sat down today to get all the rows together. I hope the border will help to calm it a bit, as there is quite a bit going on here. I think all the kids have dinner plans with friends. How odd that they would all go out without us. I was going to hide out and sew, but I guess now I'll have to be hang out with my husband instead. There is a quilt shop not far from the museum for the Girl Scout outing this morning. We made a quick stop and got for lunch before heading home. Because I had a gift certificate from Christmas and no particular quilts in the works, I hit the sale wall and focused on backgrounds. Sydney added a couple of her own choices too. She didn't quite agree with my neutrals are always necessary philosophy. Everyone seems happily involved in playing with friends now, so I think I'll sneak in to sew a bit before somebody needs me. I haven't been posting much lately, just not much time or energy for sewing these days. Everything goes through cycles though, and I'm sure my motivation will return soon. 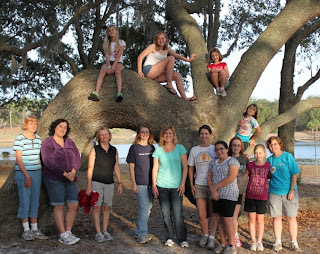 Today there is a Girl Scout trip and a birthday party, but I still hope to find some time. Tomorrow looks wide open so maybe I can have a little sewing room retreat? There were already lots of beautiful green scraps coming together last week. Use the linky below to share your progress this week. We got back from Camping around lunch time. I will admit to a quick snooze on the couch, but after that I did venture to the sewing room for a bit of time. I had some red geese left from last month and so decided to make some green to keep them company. 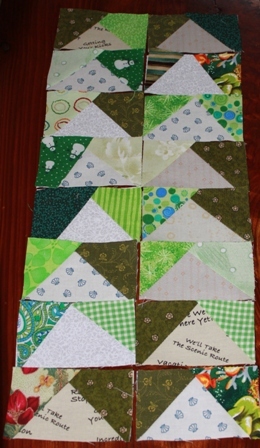 They finish at 2 by 3.5 and are just the right size for the waste triangles from joining binding strips. The camping was just perfect. 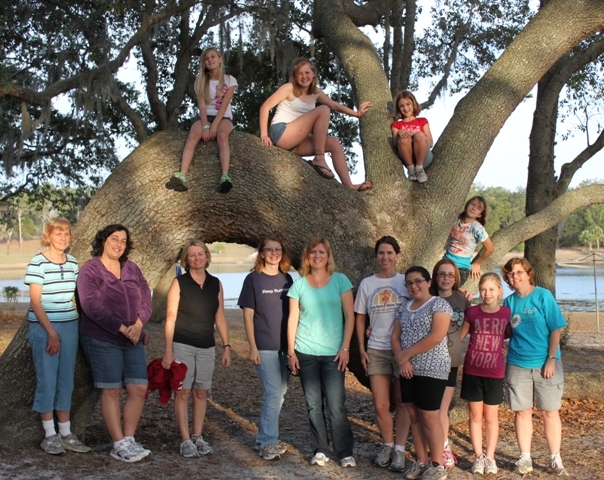 Beautiful weather, everyone got along well and the campsite took care of most of the work. Hard to ask for much more than that really. It is hard to really call it camping when you are staying in air conditioned cabins and eating hot meals served at regular intervals, but it was lots of fun nonetheless. It will probably be my last year to attend this particular event as most of the girls won't continue with scouting when they go into junior high next year. Everyone will be scattered to different schools depending on the results of applications and lotteries for all of the schools of choice. The super bowl is starting soon, and though I was content to curl up in jammies and enjoy the commercials, we've been asked over to a neighbors party and will go and visit for a bit. I had to ask who the teams were, so you can guess how keen I am to enjoy a sporting event. It will be nice to visit with the neighbors though. I think it is appropriate that the new color for February is green. I'm off this weekend at a Girl Scout camping event and being all sorts of green. 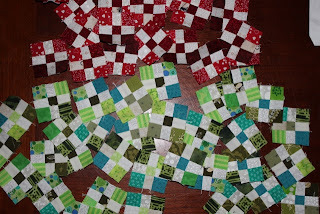 I have so many projects started with red that I should be able to just start the same cycle in green. I need to make green houses, green log cabins, green stars, a green place-mat. I wonder if all that will use all my green scraps? What green thoughts are starting to work through your head? 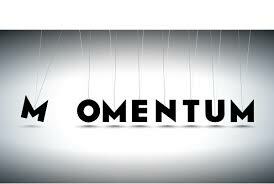 Use the link below to link up to your own green ideas, projects or ponderings. I am printing out a color symbolism chart for a freinship pin craft this weekend, this is what it had to say about green: Nature, environment, healthy, good luck, renewal, youth, spring, generosity, fertility, jealousy, inexperience, envy, misfortune, vigor. 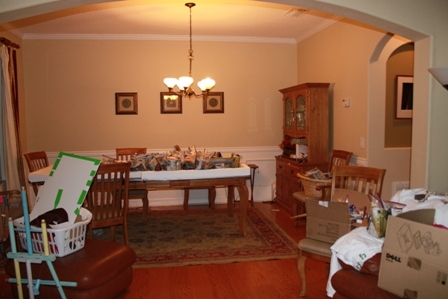 It is hard to remember the last time I saw the dining room table. I know it is under there somewhere. Buried under lego blocks and Girl Scout bags and craft supplies. The regional tournament is this weekend, and with no hope of going on to state, that should free up some space. All of the recycled gift bags are going to leader daughter along with the craft supplies. I will cook a big fancy meal when it all goes away so that we can eat at the dining room table as a family. Until then I have goody bags to stuff and crafts to organize and clothes to pack. I am looking forward to a camping weekend. Sadly that means I won't be here to sew on scraphappy Saturday. Has anyone noticed that the new color is green? I'll leave a scheduled link up box and hope that it all works as it should. I'll have my handy i-pad, but I don't think the wild outdoors has wi-fi. Have fun thinking green thoughts and I'll check back in on Sunday.